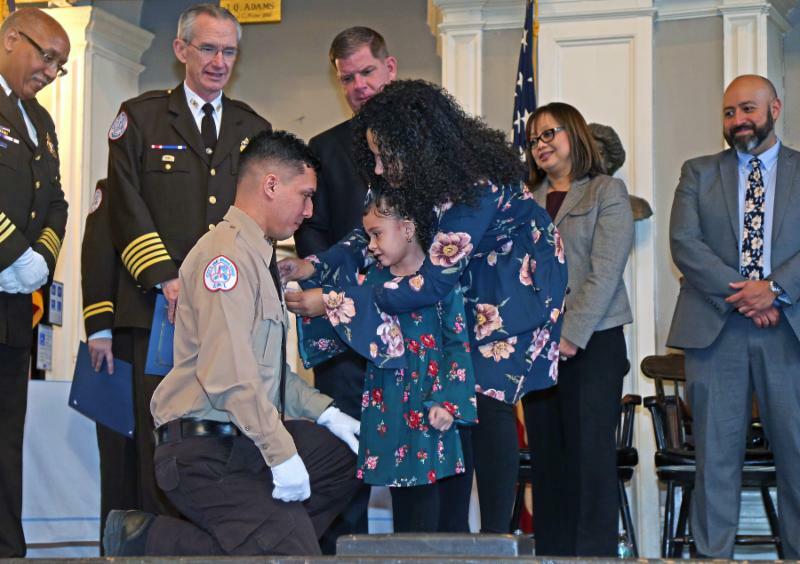 BOSTON - Monday, January 14, 2019 - Mayor Martin J. Walsh together with Boston EMS today celebrated the graduation of 19 Emergency Medical Technician (EMT) recruits in a graduation ceremony at Faneuil Hall held before family, friends and colleagues. Among those addressing the graduates were Boston Public Health Commission (BPHC) Executive Director Monica Valdes Lupi, JD, MPH, and Boston EMS Chief Jim Hooley. This graduating class will be assigned to 9-1-1 ambulances, strengthening the city's emergency medical services (EMS). In his FY19 budget, Mayor Walsh prioritized funding for 20 additional EMTs, increasing the number of budgeted full-time EMS providers from 375 to 395 for the City of Boston. The increased number of EMTs will allow for two more frontline ambulances to be staffed, included a second one in East Boston. "Becoming an EMT is more than a career -- it's a noble commitment to serve our community, and I want to congratulate all of today's graduates on joining the ranks of a proud and historic first responder family," said Mayor Walsh. "Our EMTs and paramedics are saviors on some of the worst days of people's lives, and also make possible some of our city's best days and most beloved traditions, from First Night to Marathon Monday. I'm incredibly proud to welcome this new class of recruits and thank them for their service to our City." The graduation ceremony formally acknowledges 19 recruits' successful completion of a rigorous EMT post-hire training program. The recruits, already state-certified EMTs prior to hire, completed an additional 27 weeks of classroom and field training, to better prepare them to work as EMTs in Boston. Recruits were trained in a variety of emergency situations, including life-threatening emergencies, transportation accidents, recovery services, hazardous materials exposure, human trafficking cases and mass casualty incidents. "It is with deep admiration and respect that we welcome our new EMT graduates to the EMS community," said Chief of Health and Human Services Marty Martinez. "Each of these new recruits are answering one of the highest calls to public service so anyone in Boston can receive the quality care in their time of most need. I congratulate this new class of recruits and I thank them for their service to the City of Boston." This recruit class responded to nearly 3,000 9-1-1 calls during their training including emergency incidents related to illnesses, injuries, cardiac incidents, motor vehicle accidents, childbirths, shootings, stabbings, overdoses and more. With guidance from seasoned EMT field training officers, recruits are not only prepared to care for patients, regardless of the circumstance, they also now understand the level of care, clinical excellence and professionalism expected of Boston EMS EMTs. "Congratulations to these new recruits for completing this rigorous training and joining our exemplary EMT core. The city faces unique challenges today and we are grateful to have these brave individuals choose to serve our Boston with the highest level of care and professionalism," said Monica Valdes Lupi, Executive Director of BPHC. As one of the busiest municipal EMS providers in New England, Boston EMS responds to over 125,000 emergency medical incidents per year. As a bureau of the Boston Public Health Commission (BPHC), Boston EMS is committed to serving Boston's residents through clinical excellence, emergency planning and preparedness, and community outreach. Chief of Department, Jim Hooley stated, "Boston EMS sees great value in investing in education and professional development for our newly hired EMTs. Completion of academy is only the beginning. As a career EMS clinician, we must continue to learn and evolve along with the field of emergency medical services." Building on Mayor Walsh's investments in Boston EMS, the FY19 budget includes the replacement of eight ambulances to support EMTs. This commitment by Mayor Walsh will help ensure a high-level of service for all neighborhoods, and aims to have ambulances arrive on scene for Priority 1 calls within six minutes of the initial call. Additionally, the Mayor in FY18 launched the Boston EMS Community Assistance Team that use data to change the way EMTs are deployed to areas including the Boston Common and Recovery Road, improving patient outcomes and ambulance utilization. In its first year alone, the Community Assistance Teams have freed up more ambulances, and resulted in more than 400 referrals to shelters and recovery services.